A Futurist Take on Tomorrow: Technology, Entertainment, Retail and More! Welcome to Tomorrow: The Future is Officially Here!!! What’s the single most important trend in mobile devices sweeping the globe today? The hottest new thing in entertainment since Apple and its fleet of high-tech sensations first took pop culture by storm? What does the home of the future look like, and how soon do we can get our hands on pet drones and smart cars? And who are these mysterious Millennials we hear so much about (odds are you, but shh, why ruin the suspense? ), and how do they radically differ from other generations and promise to redefine tomorrow’s workplace? Ladies, and gentlemen: We invite you to take a trip into the future and discover the answers for yourself – right here, right now, this very minute. Meet NEXT UP, our new TV series, which aims to reveal the most amazing and cutting-edge new trends and innovations in countless fields from consumer products to technology, entertainment, business, healthcare, travel and more. NEXT UP, which will air on the Discovery Channel and ION Networks as part of leading program NewsWatch (which currently screens to over 96 million viewers nationwide in virtually every major US market), and via its own standalone specials, aims to provide a sneak peek at tomorrow’s biggest breakthroughs today. SO PLEASE ALLOW ME TO INTRODUCE MYSELF, AND INTRODUCE YOU TO INFLUENCER: THE MAGAZINE OF CHANGE™ AS WELL: I’m trends expert Scott Steinberg, and it’s my distinct pleasure to help equip tomorrow’s leaders with all the skills, insights, and tools needed to successfully adapt to a world of infinite change and disruption. Just one question – why here, why now, why today, right? Easy: Because we live in an age of endless change. 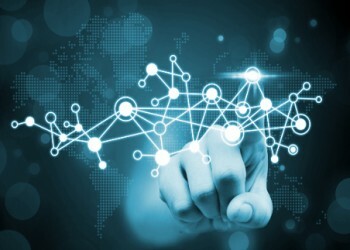 Times, trends, and tastes are constantly evolving, the world becomes more connected with each passing day, and – thanks to radical leaps in technology and communications – progress is now happening at warp speed. The next 10 years will bring more change than the past 10,000, in fact. (Holy crap, right?!) And as we point out to thousands of leaders in every field each year through public speeches, books, blogs, media appearances, and good old-fashioned online hijinks, if the future’s coming on quick, well… few of us can afford to be caught flat-footed. Some of you may know us from our TV appearances. Others, the keynote speaking and leadership training programs we present to countless organizations each year. 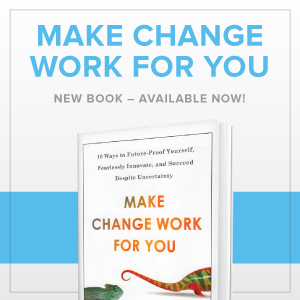 Some may have read our recent bestseller on the 10 new habits of hugely successful people and organizations, and how to innovate, future-proof, and constantly steer your way to success in life and business – Make Change Work for You. (If so, remind me that we owe you a refreshing beverage sometime!) Either way, as some of you may have noticed, we’ve been doing some serious redecorating around here. Why? Because when I ask audiences we work with to define themselves, we often get a fascinating mix of answers. Sample responses, include “I am a…”: LEADER. WORKING PROFESSIONAL. INNOVATOR. MAKER. PARENT. BUSINESS OWNER. FRIEND. THOUGHT LEADER. INFLUENCER. COMMUNITY MEMBER. Tellingly, not once have I ever heard anyone use the term “idiot.” And it doesn’t take a rocket scientist to realize: The future is here, the future is now, and the future is coming on like a tidal wave, no matter your chosen field or area of interest. If we want to prepare ourselves to greet it, we’ve got to start preparing for and learning to surf the great waves of change headed our way. One slight issue, though: Fun fact – both human beings and organizations are essentially hardwired to avoid change. And most of us sure as hell hate taking risks. But here’s the rub. In a world of endless change, that’s evolving at a blistering clip, applying the same strategies and approaches to addressing the endless array of new opportunities and challenges we face with each passing day is NOT A @#$! RECIPE FOR SUCCESS. More to the point: IN AN EVER-CHANGING WORLD, FINDING THE COURAGE TO EMBRACE CHANGE AND TAKE CHANCES IS THE ONLY WAY TO SUCCEED. And every one of us possesses all the skills we need to lead, succeed, and be bolder when it comes to confronting change – and the personal and professional concerns that we face – on a daily basis. But if you’re like me, and find it strange how virtually no one’s talking about this stuff, including the way in which fear impacts the workplace, and how virtually no one’s giving tomorrow’s leaders (let alone poor kids) the skills they need to succeed going forward – then stick around. We’re not going to let the status quo stand. As a working parent, as a business owner, as a human being, and – as, apparently, a stubborn knucklehead as well – I can’t conscience the idea of sitting back and leaving friends, family members, and our communities woefully unprepared to greet whatever changes and challenges the future may bring. Going forward, we’re going to take an ongoing look at the latest happenings and innovations in a number of new fields going forward here – and what they’ll mean in practical terms, how you can leverage them to effect positive change, and turbo-charge growth and success in life and business going forward. I don’t know about you, but frankly I couldn’t be more excited about the future. Or that you’re here along for the ride. Whatever unexpected twists or turns the road may bring, it’s thrilling to know that we’ll be navigating them together. However, navigate we will. When it comes to steering towards success, and steering around unexpected twists and turns, no matter what life + business throw your way, I think you’ll be pleasantly surprised by how simple the process becomes when you’re willing to keep your eyes on the road ahead, and sit behind the wheel and drive. Here’s to taking back control of our future. P.S. Don’t forget to catch our columns for PARADE, Huffington Post, It is Innovation, and other popular magazines as well – see you on the flipside!